I think this release is definitely going to be a favorite. I totally love it and so much fun making projects for it! which comes with this happy die! 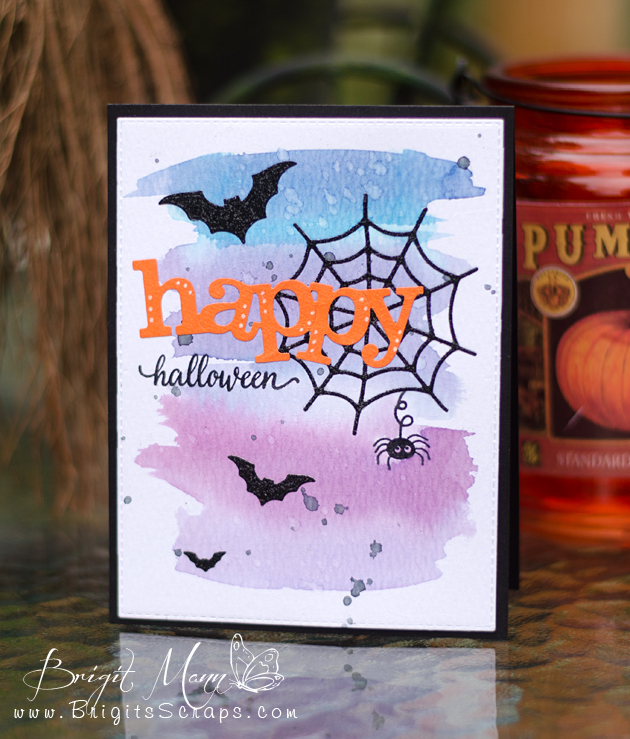 I stamped and embossed the spider and halloween sentiment which is from this new set and then watercolored the background with some Distress Inks. There's a bunch of holiday and occasion words in this set that goes with that happy die, a must have!! Stitched Rectangle Frames Dies and More - Background Layer. What a fun card! I have yet to dab into the watercoloring world but after seeing this beautiful card I'm inspired!!! You did an amazing job!!! Such a cute card, can't wait to see the rest of the release. What a cute Halloween card! I love this die already! And the font for the "Halloween" is so pretty! I am looking forward to the rest of the release this week! TFS! What a Spooktacular Halloween card!! Your water coloring turn out awesome sure made for the perfect eerie sky. Love today's sneaky peek a must have for sure...Thanks for all the Wicked Awesome ideas using Miss Emma's Goodies. What a Wonderful Halloween Card! Totally Love! I love your card. Halloween is a favorite of mine. Your card is OUTSTANDING. Super cute card! Love the water colored background!! Love this card, Brigit! The background is so gorgeous! Love this card...it is super cute! LOVE this card!!! The watercolored background is super. Love, love, love this card! I am really liking the big "happy" die!!!!! Cute card! Love your watercolor background. Love this card and how you used older MCT products with it. A fun sentiment die. Fits in for any occasion. I love the background and the orange "happy"
Brigit, I too think that this is going to be a Spooktacular release! I love the idea of having so many varieties of stamps to go with the "Happy". Love the way you watercoloured your background and the design is fantastic. Also, like the way you added the white dots on the "Happy" lettering. It gives it a nice 3-D effect. Great card. Love how you did the background coloring..on the card.. Awesome.. I love your fun Halloween night scene! I just love your card and love watercolor colors you used! Looking forward to the release. Love the watercolor background, sets the dies off so well. The big Happy is going to be easy to find uses for. Wow, love your card. The watercolor background is beautiful. Super cute card!! Just love the "happy" die!! Spooktacular indeed, Brigit! I'm crushing over your showcase of this happy die and smitten with your card! That spider is a favourite! I agree that this is a must have! Love the water color background...perfect for the web, bats and spider! Those dies and stamps are great also. Super cute card!!! Love the Stamp set and die so much. Brigit your card is a stunner! LOVE the watercolor back ground and how you incorporated Emma's stamp set. What a great stamp set for all of us card makers. Love it! Thanks for sharing your terrific Halloween card. Love the colorful background on your card. Thanks for sharing your beautiful talent with all of us. I love to see your work, always beautiful! Wow! Your watercolor background is so awesome Brigit!! Love it! Amazing watercoloring- love how you added white dots to the happy die cut. Fantastic Halloween card! Love the background you created and colors you used. Love it! brigit, fabulous watercolor background! love it! WATERCOLOR!! OMG I just LOVE your card!! I can not wait to take that class next week and be able to use my new watercolors! Brigit ~ I am with Jessica above!! I LOVE that you water colored your background with these products! Seriously FABULOUS!